AN IMPORTANT MESSAGE FROM WAH WAH 45S AND KENNY DOPE. Due to an unforeseen family emergency in the U.S., we are very sorry to let you know that regrettably Kenny Dope has had to pull out of this Saturday’s We Wah 15 event at Oval Space. Kenny wanted us to pass on his sincerest apologies for this and assure us that he’ll be back in the U.K. next year. Though we are, of course, a little sad to not have Kenny with us, we hope you’ll agree this was never about one act, but a chance to celebrate 15 years of love, great music and parties, the Wah Wah family way. We’re very excited to announce that we not only have legendary British musical pioneer, DJ, producer and Soul II Soul front man, Jazzie B, but that we’ll also be announcing a very special guest DJ of equally huge stature on Friday morning. AND, all this on top of an already bursting line up including The Reflex, Hackney Colliery Band, Resonators, The Gene Dudley Group, Lea Lea, Paper Tiger, Servini, Scrimshire and Bopperson. So watch this space! Fiercely independent London record label Wah Wah 45s celebrate a decade and a half in the music business this year, and what better way to do it than bring the mother of all their legendary parties to possibly the capital’s finest club and live music venue, Oval Space, with a very special guest and a host of live music and DJs. One half of Masters At Work, the legendary Kenny Dope, leads the way at this extraordinary event. Kenny has been a supporter of Wah Wah since day one, so it’s with great joy that we can say that they’ve managed to book the man at last, for his Wah Wah debut – it only took fifteen years! Support comes from one of the hottest DJs and re-edit kings around, The Reflex, fresh from his edits of both Hackney Colliery Band and Henri-Pierre Noel for Wah Wah 45s, and the men from the imprint itself – label bosses Dom Servini & Scrimshire, plus young blood Bopperson, who’s currently taking East London by storm on a regular basis! As with any Wah Wah party, there’s also a lot of live music on the bill, and with this being such a landmark celebration you can of course expect only the biggest Wah Wah live bands. 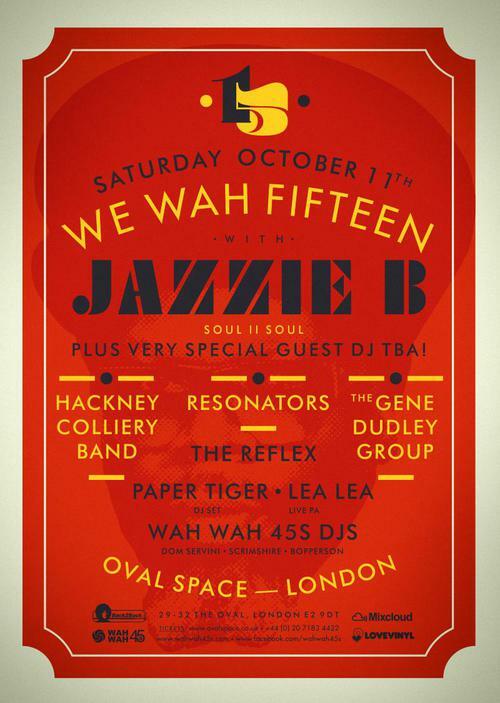 East London brass juggernaut Hackney Colliery Band will be taking the stage, as well as much loved reggae and dub outfit Resonators with support from funk upstarts The Gene Dudley Group and a little electronica in the mix courtesy of Hackney’s own Lea Lea and Leed’s finest, Paper Tiger. We Wah Fifteen will be a visual as well as an aural feast of course, with optical delights from long time collaborators Jim and Exceeda, and don’t forget to check out the Wah Wah Shop for all your vinyl, CD and merchandise needs. Please note this is an 18+ event. ID required.